Bones are rigid organs that serve various functions in the human body from protecting various organs f the body to producing red and white blood cells. Bones come in a variety of shapes and have a very complex internal and external structure and are lightweight yet strong and hard. Damaged bones can be replaced with bone from other parts of the body (autografts), cadavers (allograft) , or with various metallic alloys or ceramics. Using autografts puts a limit on how much bone is available for the rest of the body and the other options can result in rejection by the human body. However, utilizing 3D engineering, doctors and researchers from Japan and China are able to find a solution. The Kyoto University Graduate of Medicine announced that it can now create artificial bones using 3D printing and has transplanted the bones into four patients with cervical spine disc herniation. With their new transplants, the patients have reported improvements in symptoms such as hand numbness and gait disturbances. Using images from a MRI and CT scan on a patient's neck, the researchers were able to design a file and send it to the 3D printer. 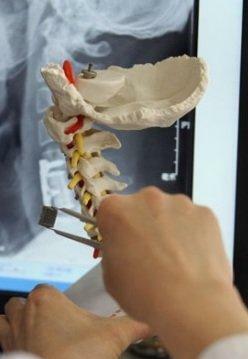 The bone is composed of many thin layers of titanium powder and fits perfectly to the cervical spine. Afterwards, an extra chemical and heat treatment of the bone is conducts and the bone is transplanted into the patient's neck. While this treatment is relatively new, all 4 attempts have been successful thus far; which is a great sign considering the artificial bones costs only several thousand yen, which translates to less than 100 dollars US. It is believed that this technique is particularly advantages for replication of bones that have a complex shape such as the pelvis, which is specifically what scientists at the Peking University Third Hospital in Beijing are working on. Led by Liu Zhongjun, director of the department, the team at the Peking University Third Hospital has been working on a project to create a perfect fit pelvis implant for four years. "We started clinical trials on 3D printed implants late last year, and now we have used dozens of such implants for more than 50 patients," said Liu. "All the patients recover very well. Nobody seems to have any undesirable side effects or adverse reaction." "3D printing technology has two very nice features: 1. It can print specific structures; 2. It is capable of producing porous metal." Liu explained. "For example atlantoaxial is an oddly shaped vertebrae, the shapes of orthopedic implants used nowadays are usually geometric patterns and can not attach to bones firmly. But 3D printed implant fits perfectly and could greatly enhance the firmness." With the use of the porous metal, Liu says that the new material allows to bone to grow into the metal pores and enhance the strength of the implant. "In the past we used clinical titanium mesh, but with the growth of bone, titanium mesh could easily stuck into the bone and cause collapse. 3D printed implants fit the bone completely. And as a result, not only the pressure on the bone is reduced, but it also allows the bone to grow into the implants."